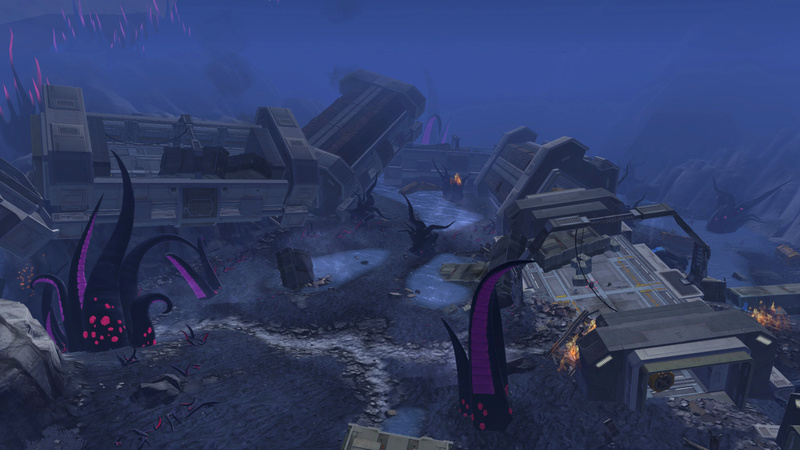 Following on from the War on Iokath (which I’ve yet to write about for various reasons), Crisis on Umbara a new Flashpoint from SWTOR, picks up a thread left ‘hanging’ on Iokath. During your attempt to stop the Republic and Imperial forces taking the Super Weapon a sabogated Throne brings you face to face with Tyth – one of the machine “gods” of the Eternal Empire. 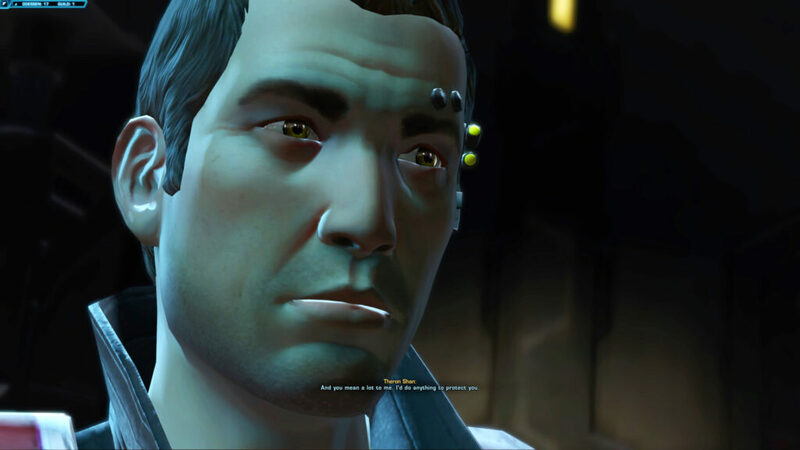 He informs you that you were lured to Iokath, that you have been betrayed – by someone inside your Alliance. The mole-hunt is on. 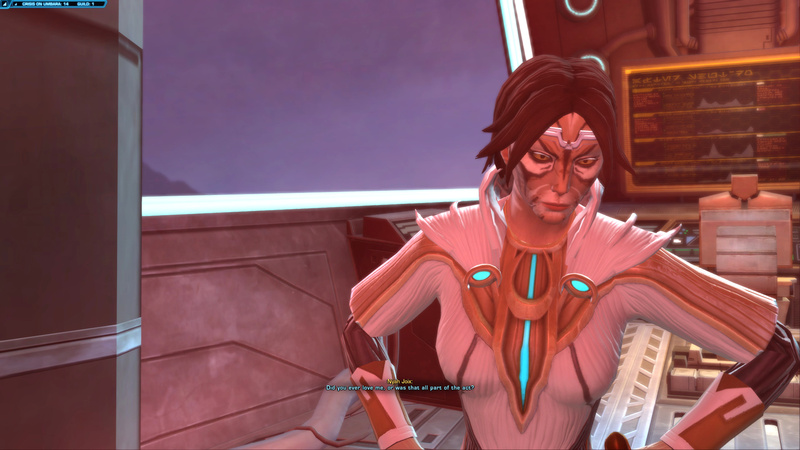 In this post I will talk about the broad story of Crisis on Umbara, give a hat-tip to Bioware and then discuss what Theron Shan may be actually up to, with help from @Quinny_Imp. Yes, I realise they very rarely get thanked but they deserve it here. 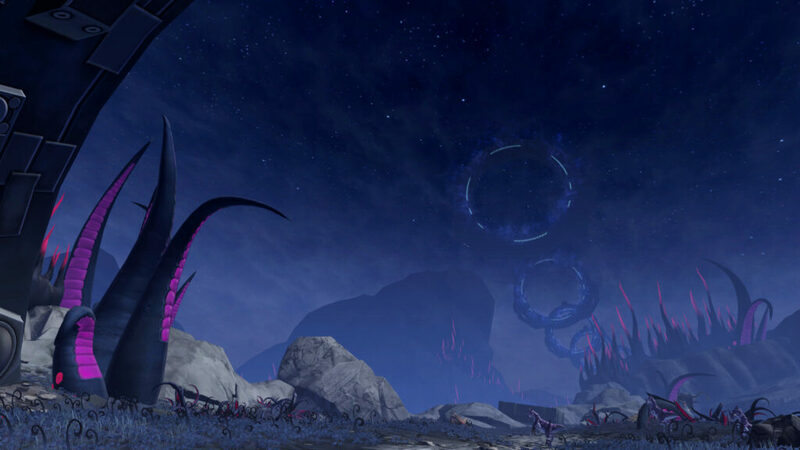 I found the end of KotET, and the story missions of War on Iokath very hard on my Fibromyalgia. There was a lot of stress in the combat and they raised my pain levels. I have been pleasantly surprised that the [STORY] chapters for Crisis on Umbara are very manageable, even when playing a healer. There is challenge (like a double boss fight on a train!) but I haven’t died yet. If you ignore my random falling off the stationary crashed train anyway. So thank you for allowing me to focus on the story and not be put off by the difficulty level. 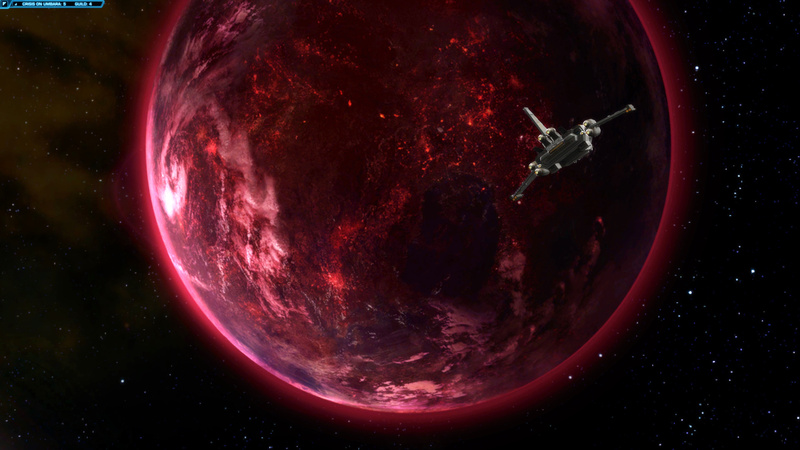 If you want to learn more about Umbara as a planet, please check out Xam Xam Says’ Guide. Here I’ll give an overview of the plot. I’ll also make adjustment where things said change depending on your emotional involvement with Theron. 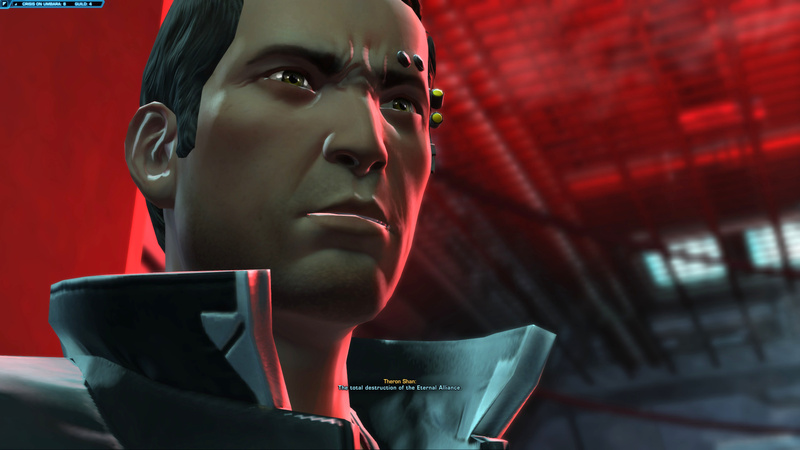 You start by talking with Theron Shan about the War on Iokath, but as expected things are in stalemate. He also does not have any information about the in-house traitor. Lana however does, with the traitor’s signal coming from Umbara – specifically from a train carrying Adegan Crystals (of Battle of Ilum fame). It seems the traitor is helping the Republic/Empire (the opposite side to your allegiance on Iokath) steal them. The race is on to capture the traitor. 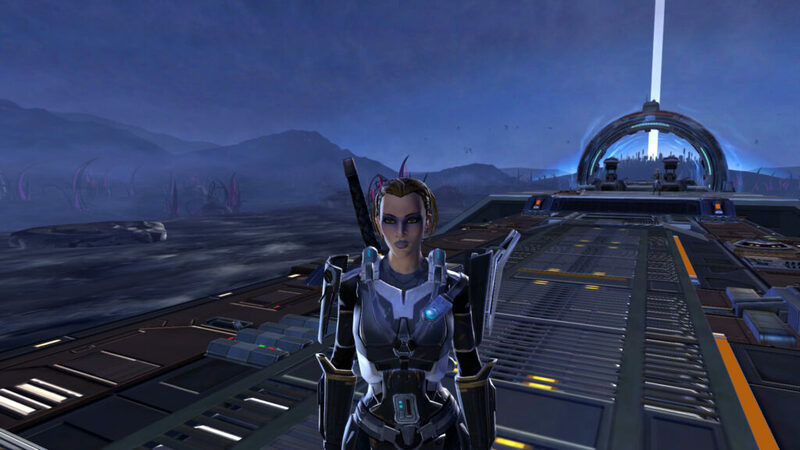 In this write-up if I refer to ‘Republic’ troops, it’s because I have mostly sided with the Empire on Iokath. I need to do a Republic-sided run soon. So replace ‘Republic’ with ‘Imperial’ to save me typing both each time! 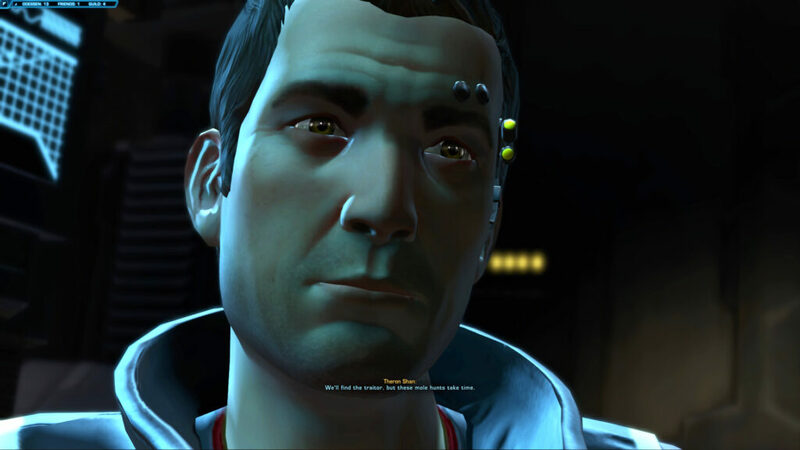 Romanced Theron: During this scene, Theron Shan insists that he would do anything to protect you. You also manage to get a relatively uninterrupted ‘moment’ with him. You, Theron and Lana are deposited on top of the moving supply train. Your job is to fight to the front. I don’t want to cover combat in detail here but just a few things to bear in mind. Don’t just leap into battle. Many carriages have traps that are triggered if you step on/into them. Lana/Theron don’t seem to trigger these. On my third run I spotted a datapad that seemed to disable some traps, so look out for that. When you reach the double boss fight on the train, take out the engineer first else he’ll keep making more turrets! Once you’ve navigated various Umbaran ambushes and two bosses, you finally make it to the driver’s compartment. Crisis on Umbara all Theron’s Doing? It’s only at this point when you find the driver’s seat empty, that Theron shoots past you into a window and blasts the console to lock you in, with the train on a collision course. He then has a sizeable monologue, revealing that he was working for peace in the Galaxy, but you hadn’t fulfilled that vision. Theron has a “plan”, which is as precise as he gets. In a confusing phrase he claims the Alliance is “rotting from the inside” and you’ve become a “symbol of oppression” (Note, even if you chose the peaceful end to KotET Chapter 9, The Eternal Throne). In this dialogue and in many of his expressions, he looks conflicted. He wanted to tell you about his malcontent, but “couldn’t take that risk”. 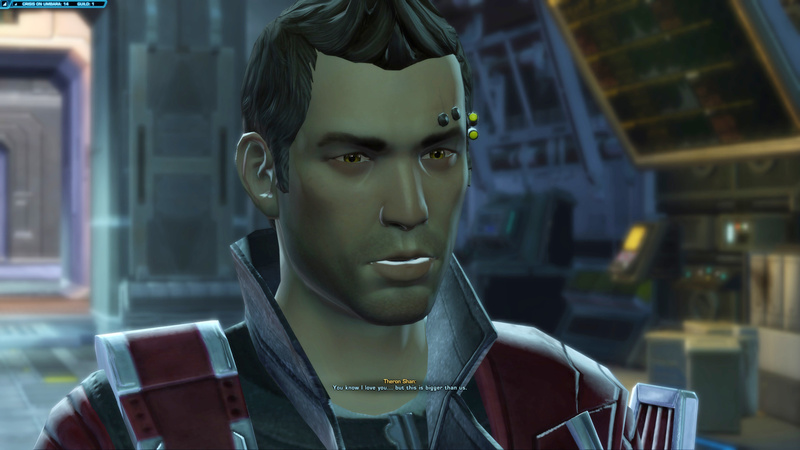 And if you’re romantically involved, or simply talk to him kindly, a very obvious sad expression crosses Theron’s face. Note: the conversation option with Theron (effectively Light/Dark side) has an impact on non-choice dialogue later on. It’s up to you whether you try to dissuade him or threaten to hunt him down to make him pay. Romanced Theron: You can ask him if he loves you or whether it was just part of the spying act. Again, an odd response follows: “You know I love you, but this is bigger than us”. This? Does he mean striving for peace, or his “plan” or something more? 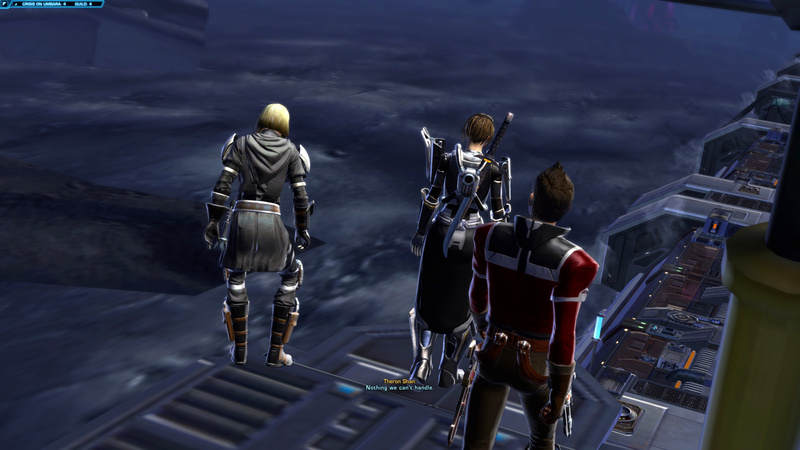 As you wander through Umbara, Lana notices not all the Adegan Crystals have been taken by Theron. You wonder (out loud) why. Although you catch Theron has he boards his shuttle you are too late. He says that “this is only beginning”. In the closing scene of the Flashpoint, Theron gets a transmission from a “Myserious Figure”. Effectively saying that Theron’s proved himself so now “welcome the Order”. The dress-code of this figure looks remarkably like the Scions of Zakuul, and it definitely appears similar to the person who oversees the sabotaged “Throne” on Iokath. If it’s not the same person then, it seems like they are from the same “Order”. As far as I know we know little else. I’ve uploaded two videos with contrasting conversation options. The first is a tough come-down on Theron for his betrayal, along with placing a bounty on his head. The second is the Romanced Version, and taking dialogue options that state the intention of always loving him. So What Is Theron Shan Really Up To? 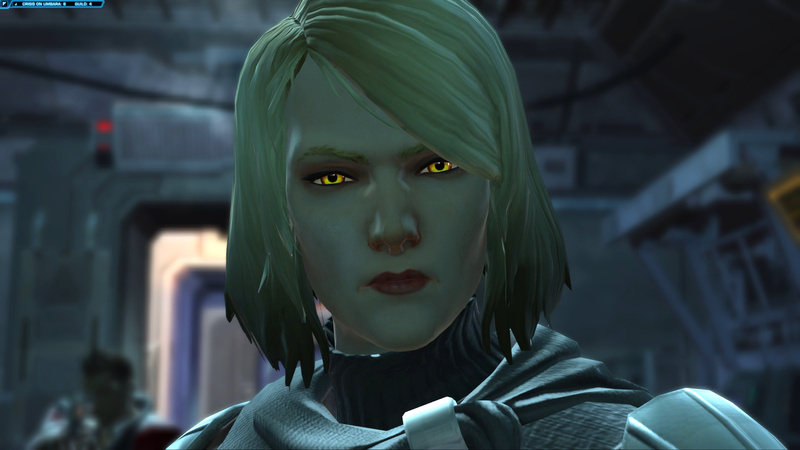 Right up to Iokath, Theron has been an integral part of your life, your Alliance and the story as a whole. His ranting during Crisis on Umabra seems like a total contradition to the Theron we have known up to this point. When Theron shoots you the first time, he misses. Theron is a good shot. He wouldn’t miss a human-size target from 2 metres away. He missed on purpose. Note: This is down to your character’s perception of the situation. 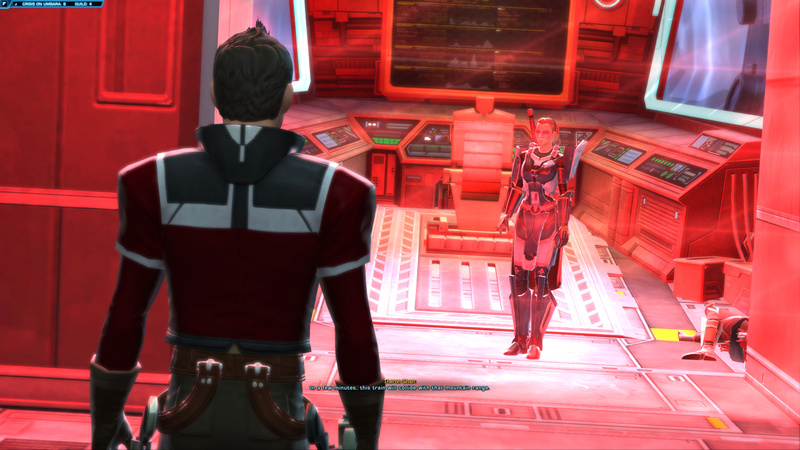 Theron could have tried to fire at you and Lana intercepted it, but it also looks like a ‘first’ shot’ at the console. The shot Lana takes seems to stun her for a short while as she’s on her feet before the train crashes. So decide what works for your ‘head canon’ and run with that! When Theron shoots the second time, he hits the window and breaks it. Missed again? No, he created an escape route for you to use before the train crashes. Third shot activated the forcefield for you not to chase him, and to have no choice, but jump through that broken window. He tells you what’s going to happen: the train will crash, and how much time you have. It’s a warning: don’t stay in, run or you’ll die. Just before he walks away, there’s sadness and regret on his face. He leaves MOST of the crystals behind, instead of taking them all. 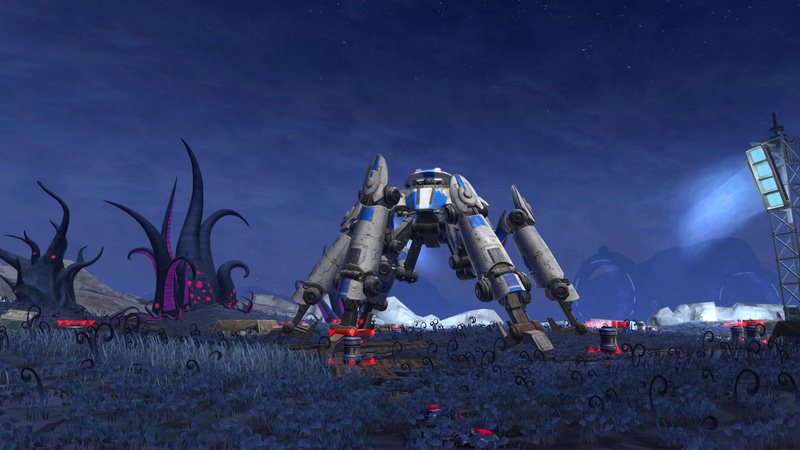 He leaves them for you to use them in your fight, so doesn’t leave you defenceless in your fight for Iokath. He looks really regretful after hearing your message. He “can’t” return to you, not “I don’t want to”. It’s far from his speech “you’re a tyrant, the Alliance outgrew you”, when you can’t see him. His “beaten puppy” face when you tell him you’ll always love him. My guess at this point is that he uncovered a real threat to you. As I believe the line “I would do anything to protect you”, he may be doing a Double Agent act here. Going deep into the threat this “Order” poses to you. Note, he doesn’t say he’ll protect the Alliance, but you personally. Whether this ‘guess’ is accurate or not I don’t know, but Theron, during Crisis on Umbara seems out of character to be purely out to destroy you. 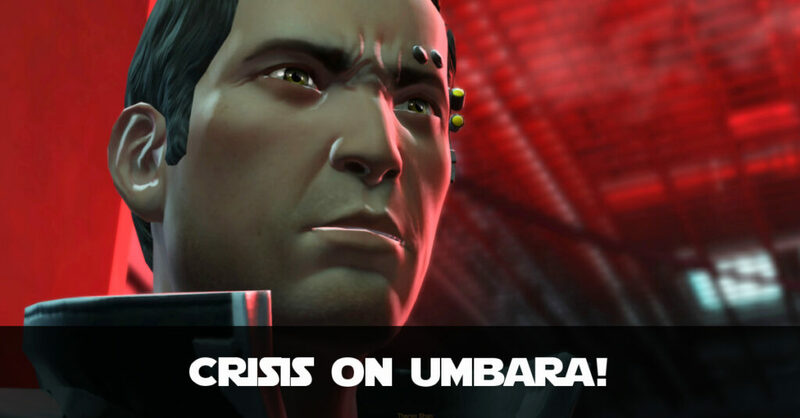 TL;DR Crisis on Umbara – What Are We Left With? In all honesty, the Eternal Empire/Alliance has to end at some point, so maybe we are seeing the early warning signs of that. The Crisis on Umbara leaves your Alliance reeling with Theron’s betrayal, the Commander let down again and Theron disappearing off to join some “Order” or other. That Theron’s actions and his emotions appear at conflict, whether you romance him or not, does bear thinking about. If he would do anything to protect you, what is he protecting you from? We’re a long way from answers to these questions. And not all questions were answered during KotFE/KotET, but I hope that something will eventually make sense from Umbara. Hmmm, I got more of a “Herold of Zildrogg” vibe from that masked figure. The Heralds are a doomsday cult that works towards the extinction of sentient life – if your logic is twisted enough that would mean eternal peace. You can’t make war without people. Yeah, warped logic, but…has it’s own logic! It would have to be Heralds-esque as I don’t remember them being described as an “Order”. In the interests of objectivity, neither were the Scions. It’s feeling a bit like Revan’s tactic, let Republic/Empire destroy each other to bring about a conclusion. Take Eternal Alliance with them, then make one huge society from the rubble! I agree that he is not a traitor here. I went back and created a new character and watched him like a hawk through all the story dialogue and it’s not in his personality to betray like that. You go through a lot with him when you start the SOR and up to this point it just doesn’t make sense. His face and emotions played on the train, before and after were definitely all contradicting. He is definitely not a saint but I don’t feel he would ever betray and it’s a double agent deal. 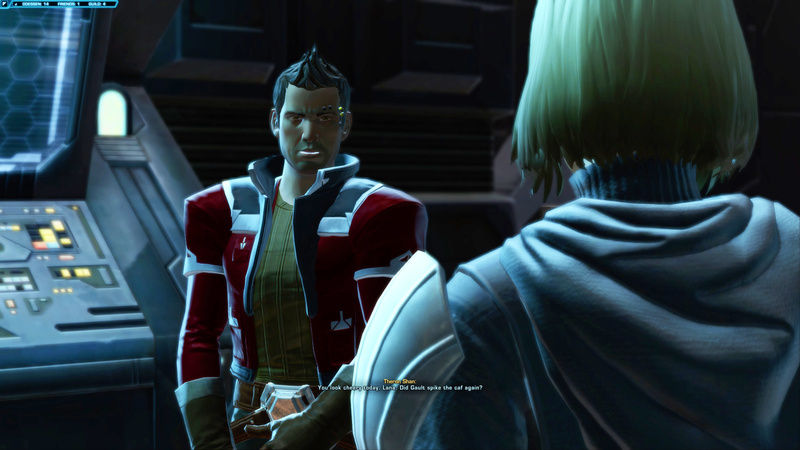 There are some hints in Iokath that he’s up to something, and Tyth does say you’ve been betrayed *but* Tyth can’t know what Theron is up to on other worlds outside of Iokath. It definitely feels out of character and he’s battling with the situation he’s in, so I agree with your input here! What is your opinion on this scenario. I play a female Sith warrior who obviously has seen her share of betrayal, especially by her former husband. She killed Quinn because she wanted him out of the way. She loves Theron. Now she gets betrayed again. Being the typical Sith, her passion and anger come through at this betrayal. She still says she loves Theron but in the end she is pretty upset with him and puts a bounty on him. This is the only character that romanced Theron I did this with because I was curious on the outcome. The mail response from Theron is the same whether you romanced him or not (kind of disappointed about that). At least on the non-bounty side you get two types of mail (one for romanced and non-romanced). What do you think will become of characters who chose to put a bounty on Theron? Do you think it is the end of their relationship with him – friend or lover? Yeah I wondered the same thing. Your Sith acted consistent with previous experiences. My female Sith Warrior also romanced Theron but had to fight not to say she’s chase him across the galaxy. What is interesting is that, as far as I can tell, you don’t get an Your Action Will Be Remembered message. So I suspect that how you ultimately deal with Theron Shan will be determined when you next meet up with him. Remember, you as the player get an extra insight that your character does not. Theron does still love you but “can’t” come home to the Alliance. What did Theron say in his ship when you, as a lover, put the bounty on him? (As I haven’t played your combination of Love+Bounty myself). He just said I am sorry commander and shut off the holo. I still sensed regret in his voice, which makes me wonder if all his communications are monitored by the Order or he isn’t taking any chances in blowing his cover. I think that’s why he sends the nasty gram to your character. At least that is what I am hoping. I’m surprised the writers didn’t do a specific line in there, because he would be (probably) hurt because he thinks you love him (and he still loves you) so to be treated so harshly should have invoked a different response. At least in my humble opinion. I wondered about his comms being tracked as well, but not sure given the letter you receive if you are romantically involved with him but choose not to place a bounty. We’ll see, I just hope they don’t string this story out too long. LOTRO Farmers Faire 2019 Guide – Enjoy Food and Fishing at Bywater!